THE WRITING BUDDHA - Opinions | Books | Movies: Life Mantras by Subrata Roy Sahara (Book Review-3.75*/5) !!! 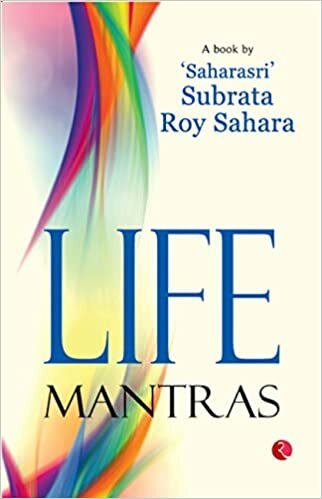 Life Mantras by Subrata Roy Sahara (Book Review-3.75*/5) !!! Whenever it comes to self-help and motivational book, I am the first person to stand in queue to grab it. This time I got my hands upon 'Saharasri' Subrata Roy Sahara's "Life Mantra" which is published by Rupa Publications. Specialty about this book is that the author have scribbled all the chapters sitting in the Tihar jail where he has been kept since last 2 years under many charges of not refunding his dues in a proper way to the SEBI etc. Leaving the personal life of the author aside and only talking about the book, I would say this almost 300 pages thick book is something you should definitely have in your bookshelf. Though the book is slow and you will find author repeating himself quite a times but it's worth reading. The concepts about life that author have covered are great and would really be helpful to someone who wants to know basics behind being happy and gay. The chapters are nicely divided which makes it easy for the readers to read this book in breaks. I took 3 days to complete this book even though I could have done it in a sitting just for the reason that I wanted to memorize the words of wisdom. Such books are not meant only for reading but for remembering and implementing it in our lives. The book definitely explains the basics in a very simple and precise manner which can be understood even by a naive reader who have picked such kind of a book for the first time. There's a kind of spiritual touch in the way author have formed his sentences and developed the chapters. You will find his writing style more calmer than aggressive even when the book is all about providing you motivation to lead your life in a better way. Many feminists might not like few of the advises given by the author as he is asking them to consider men at a little higher level than them. Haha! Well, the generation from which the author belongs, his thoughts are purely valid. But I had doubts at many places where the author has contradicted his own words. It may be because he sees different situations under different parameters. The initial 100 pages are purely blissful while the second half isn't much original as everything seems to be derived from these first few pages itself. Hence, even when I wish to rate this book much higher, I am unable to do so. I give it a very good 3.75* out of 5. Surely recommended.